Discover something new about wine! An informal and fun way to discover a whole world of wine! This course runs for 6 weeks, one evening per week, starting on Tuesday 5th of February . The Wine Appreciation Course will give a comprehensive overview of the wines of the world. The various styles, vintages and the relationship of food and wine will all be covered. Each evening we will sample a selection of wines, notes will be provide. (Should you wish detail information that can be provide also) Each Class begins promptly at 7.30 pm and will run for one hour and half. Introducing the various styles, grapes and wine philosophies of the leading wine producing country in the world. 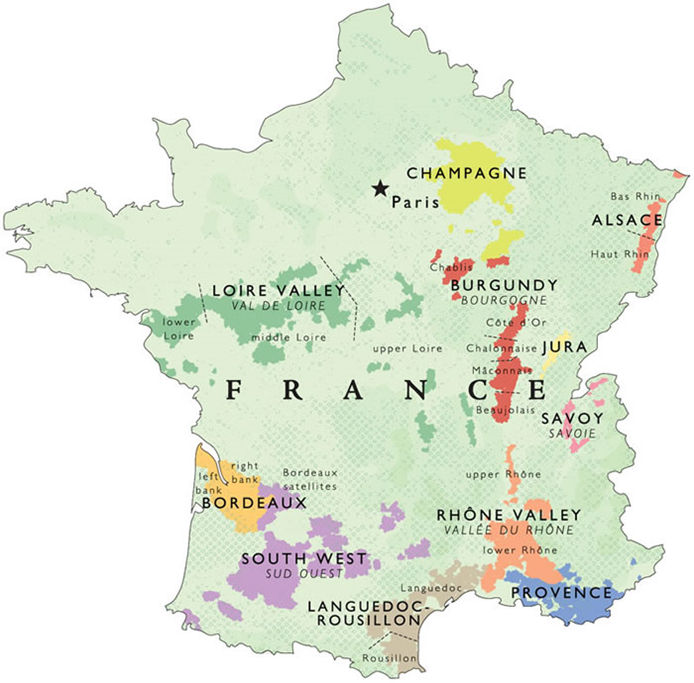 It starts from basics and it covers France’s principal wine regions and grapes. A country that is emerging from a bit of an identity crisis, now looking to produce regionally distinct wines. We reckon Australia has never made better wines. Come and sample Clare Riesling, Orange Pinot and Mudgee Shiraz among others. Much like Australia these countries that boomed for one style of wine and are now looking to attract people with their regionally distinct styles of Cabernet Sauvignon, Sauvignon Blanc, Malbec, Carmenere, Pinot Noir, Chardonnay and Riesling. Fairly new entrants to the Irish market Portugal and Austria are fast become a customer favourites with its fruit driven stylish reds and crisp refreshing whites. We will also take in a selection of German wines. Spain the trendiest wine country at the minute. This course will acquaint you with Rioja, Rueda and Rias Baixas along with Tempranillo, Albarino and Garnacha. This will introduce you to some of the major wine regions of Italy, a country that we could focus a whole six week course on and only cover one region. Areas covered will be Piedmont, Valpolicella and Tuscany. Places can be booked by emailing tadhg@woodberrys.ie or alternatively by calling 091-533706. The course is sold as a complete 6 week course with full payment of €160 required to secure a place. This course runs for 6 weeks, one evening per week, starting on Tuesday 2nd of October. The Wine Appreciation Course will give a comprehensive overview of the wines of the world. The various styles, vintages and the relationship of food and wine will all be covered. Each evening we will sample a selection of wines, notes will be provide. (Should you wish detail information that can be provide also) Each Class begins promptly at 7.30 pm and will run for one hour and half. Dates: Tuesday 6th February until Tuesday 13th March inclusive. This course runs for 6 weeks, one evening per week. The Wine Appreciation Course will give a comprehensive overview of the wines of the world. The various styles, vintages and the relationship of food and wine will all be covered. Each evening we will sample a selection of wines, notes will be provide. (Should you wish detail information that can be provide also) Each Class begins promptly at 8pm and will run for one hour and half. A country that is emerging from a bit of an identity crisis, now looking to produce regionally distinct wines. We reckon Australia has never made better wines. Come and sample Clare Riesling, Orange Pinot, and Mudgee Shiraz among others. Much like Australia a countries that boomed for one style of wine and is now looking to attract people with its regional distinct styles of Sauvignon Blanc, Malbec, Cabernet, Pinot Gris, Pinot Noir and Riesling. These three are considered by us to be the “New Old World” and are fast become a customer favourite with its fruit driven stylish reds and crisp refreshing whites. This will introduce you to some of the major wine regions of Italy, a country that we could focus a whole six week course on an d only cover one region. Areas covered will be Piedmont, Valpolicella, Tuscany and Puglia. Places can be booked by emailing tadhg@woodberrys.ie or alternatively by calling 091-533706. The course is sold as a complete 6 week course with full payment of €140 required to secure a place. We are running our wine classes again this October, Starting Tuesday 3rd of October and running for 6 weeks through until Tuesday 7th Novemeber. Each class begins at 7.30 and runs for about one and a half hours. We will sample between 8 and 10 wines each evening witht the themes as follows. €140 FOR ALL SIX EVENINGS. THIS INCLUDES NOTES ON THE COUNTRY AND WINES AND 8-10 WINES TASTED PER EVENING. Australia spent millions of dollars to build a brand around Shiraz –Australia’s word for Syrah. However, despite the success, Australian wines have suffered in the people’s minds, often disregarded as “Critter Wines” –referring to the cute animal designs that adorn wine labels. It’s time to dig deeper than the bottom shelf at the supermarket and find out what Australia wine regions are all about. There’s more to Australian wine than Yellow Tail and Little Penguin. What is Australia Known For? As you might guess, Australia’s main vineyard produce is Shiraz followed by Chardonnay. The two varieties make up 44% of the total wine production. What the production totals don’t say is that Australia is trying to diversify with plantings of Tempranillo, Sangiovese and others on the rise. Adelaide is the hub of the largest wine growing region in Australia. A few miles from Adelaide is Barossa Valley, South Australia’s most prestigious growing area. The region is unique because of its isolation from the rest of the world. Phylloxera hasn’t yet infected vineyard soils in Barossa, which means its home to some of the oldest living vineyards in the world. Old Vine Shiraz is definitely top notch, it’s both smoky and rich with spice. Keep your eyes peeled for red blends called GSM: Grenache, Syrah and Mourvedre –The major blending grapes used in French Southern Rhone wines. Barossa Valley is flanked by 2 famous regions for white wine. Clare Valley produces some of the richest Riesling in Australia and some excellent Cabernet Sauvignon and Shiraz. The Eden Valley is known for its very minerally and dry Rieslings. Not forgetting Adelaide Hills home to some of Australia’s best Sauvignon Blanc, and also very impressive Pinot Noir and Chardonnay. The major production in New South Wales comes from the inland Big Rivers Zone. This area has historically produced much of the commercial Chardonnay and Shiraz from Australia. However, New South Wales is also home to the up and coming cool climate areas such as Orange and Mudgee producing great crisp whites and elegant smooth reds, as well as the Famous Hunter Valley with its stunning Semillon & Shiraz. Commercial winemaking in North West Victoria makes up the majority of wine production in the entire region. However, the growing areas of interest are cooler and closer to Melbourne such as Mornington Peninsula and Yarra Valley, both producing great Chardonnay and Pinot Noir. Some of Australia’s top producers can be found south of Perth in Western Australia in a region called Margaret River. Where they produce elegant reds based on Cabernet and voluptuous white based on Chardonnay and Semillon. For Many centuries the big name wines of the world were from the classic wine regions of France, Bordeaux, Burgundy and Rhone Valley. While many have discovered the treats of Spain, Italy and Australia among others, the French have rallied and are now producing better wines particularly in the south of the Country. France is habitually among the world’s leading producers of wine in terms of volume produced! Meaning not all French wine is good in fact quite a lot of it is mediocre or just plain bad! France’s main wine regions are Bordeaux in the South West, Burgundy in the centre near Lyon, the Rhone Valley to the South of there and the Loire Valley which follows the course of the river from Nantes in the west inland. Bordeaux is perhaps the most famous region and it has given us the Grape varieties Cabernet Sauvignon, Merlot, Malbec in reds and Semillon and Sauvignon Blanc in white. Many wines produced here tend to be called Chateau XXXX. 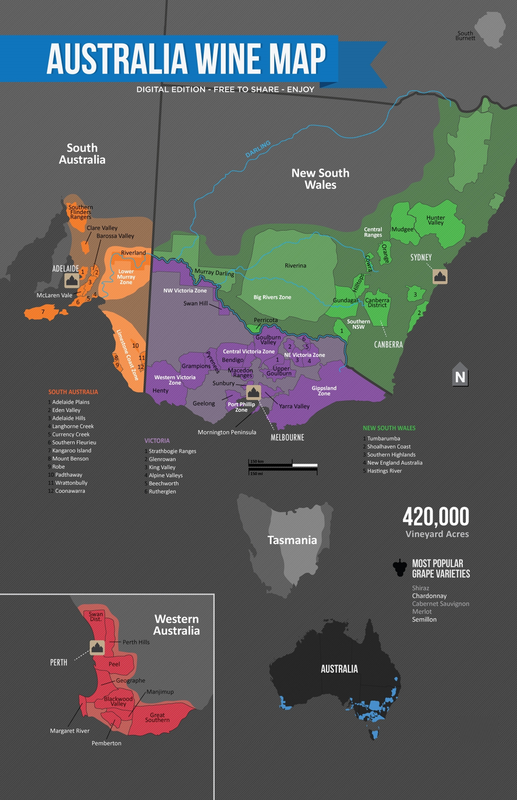 This region, it may surprise you produces more wine than all of the continent of Australia. While dry tannic reds dominate here, there are many crisp dry whites along with some of the most famous Dessert wines, Sauternes. Many of the wines of Bordeaux are name after the small village where they come from e.g. Margaux, Pauillac and St. Émilion. Next to Bordeaux in fame is Burgundy which boast the queen of white grapes Chardonnay as its primary grape and the fickle Pinot Noir as its red counterpart. As in Bordeaux the wines are named for the villages from which they hail. The super lean and minerally Chablis being a fine example of the French idea of Terroir – a sense of place- grown on chalky limestone soil this chardonnay tastes like no other. Almost all the wine produced in Burgundy is made from either the light and ethereal Pinot Noir or the terroir reflective Chardonnay. The most famous villages are located in the Cote d’Or while further south the Maconnais and Cote Chalonnaise produce more fruit driven styles. Most producers here tend to label their wines after their family name with prefixes such as Domaine being commonly used. In the Southern part of Burgundy the area of Beaujolais is located, the wines made here are from the Gamay Grape variety and can be found labelled as Beaujolais, or again after their individual villages such as Fleurie, Brouilly and Morgan among others. To the south again of Burgundy is the Rhone Valley an area that stretches along the river Rhone south from Lyon to Avignon. The northern half of the Valley is famous for its Syrah based wines, in fact most of the famous appellations here allow only Syrah and maybe in rare case some Viognier. Famous appellations here include Cote Rotie, Hermitage, Cornas, and St. Joseph in the reds and Condrieu in the white. While most Cotes Du Rhone wines come from the Southern Rhone, the area also has some notable appellations such as Vacqueryas, Lirac, Rasteau and the ever popular Chateauneuf-du-Pape. Most of the southern Rhone reds are based on a blend of Grenache, Syrah and Mourvedre, the wines of Chateauneuf can include up to 13 grape varieties including 5 white grapes such as Rousanne. The Loire Valley is the final of the big four wine producing areas and itself is divided into 4 distinct districts, the river mouth around Nantes where the Muscadet rules, the neighbouring areas of Anjou famous for its rosés, and Touraine which produces reds from the Cabernet Franc variety under the village names Chinon and Bourgueil as well as others along with delightful whites based on Sauvignon Blanc and Chenin Blanc. One of the more famous Chenin Blanc appellations is Vouvray which can be off dry. Finally the upper Loire is home to the most famous appellations of Sancerre, Pouilly Fumé, (not to be confused with Pouilly Fuisse from the Macon), and Menetou Salon. While all these areas can produce rosé and even reds it’s their Sauvignon Blanc wines that people really enjoy. Other wine producing regions in France include Champagne which uses 2 red grapes Pinot Noir and Pinot Meunier along with Chardonnay to produce the world’s most famous sparkling wines. Alsace on the German border and very influenced by its location as it mainly produces the German variety Riesling in various styles and Gewürztraminer along with some excellent Pinot Gris (Pinot Grigio). Provence which is most famous for its rosé wines and the huge Languedoc and Roussillon which is most famous for vast litres of plonk but thanks to New World flying wine makers has been turning out some superb wines based on Syrah, Grenache and even Cabernet. There are 4 main classifications, the largest is AOC/AC which says where the wine come from and that it is made from the approved grapes e.g. Sancerre, Lirac, and Pomerol. The next is VIN délimité de qualité Supériuere VDQS which has similar restriction but is not as classified as AOC. Next is Vins de Pays VdP, which usually states where it is from e.g. Vins de Pays d’Oc and sometimes also the grape variety. Finally then you have Vins de Table which can be made of just about anything! We’re hoping to kick off our first proper wine school this September, what we’ve come up with is a six week course running from mid to late September and finishing up the last week of October. We’ve got limited space in our cellar tasting room so places are limited to 10 people and the course will run every Thursday evening from 8pm-9.30pm. This Wine Appreciation Course will give a comprehensive overview of the wines of the world. The various styles, grapes and regions of the major wine producing nations will be covered ( A few have been left aside this time due to timing sorry Argentina, Austria, Chile, Germany and South Africa). Each evening we will sample a selection of wines, notes will be provide. (Should you wish detail information that can be provide also). A country that is emerging from a bit of an identity crisis, now looking to produce regionally distinct wines. We reckon Australia has never made better wines. Come and sample Clare Riesling, Orange Pinot, Mudgee Shiraz among others. Much like Australia a country that boomed for one style of wine and is now looking to attract people with its regional distinct styles of Sauvignon Blanc, Pinot Gris, Pinot Noir and Riesling. A Fairly new entrant to the Irish market Portugal is fast become a customer favourite with its fruit driven stylish reds and crisp refreshing whites. This will introduce you to some of the major wine regions of Italy, a country that we could focus a whole six week course on an d only cover one region. Areas covered will be Barolo, Valpolicella and Tuscany.